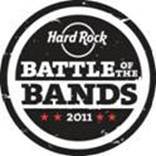 BATTLE For Best Local Band OPEN FREE TO THE PUBLIC Thursday Night at Hard Rock Cafe Tampa! Hey folks! Jerm here with an update for you coming hot off the presses from our friends over at the Seminole Hard Rock Hotel & Casino! It’s down to three amazingly talented local bands -. Lovestruck Robot, Mr. Bella and Seven Years Past - as 98Rock’s Jesse Kage, Lauren and Killabrew, the Battle judges, decide the best of Hard Rock’s Rock Battle of the Bands. The festivities will be held at the Seminole Hard Rock Hotel & Casino, Tampa this Thursday, March 3 at 10 p.m. The 21-and-over public is invited to root for their favorite band, free of cover charge. The winner of that night’s competition, to be held on the stage of the new Hard Rock Cafe Tampa, will go on to compete with other finalists on www.hardrock.com, The bands with the most votes from each international region will win the opportunity to open for Bon Jovi at Hard Rock Calling 2011 -- one of the world’s most iconic music festivals -- at London’s Hyde Park, in June. A panel of acclaimed industry experts, including Little Steven Van Zandt of the legendary E Street Band, Pete Wentz of hit rock group Fall Out Boy, Live Nation Vice President of Promotions Toby Leighton-Pope, Hard Rock International Chief Marketing Officer John Galloway and Absolute Radio Director of Marketing Clare Baker, will help narrow down the choices from across the globe. The top bands will then be posted on www.hardrock.com, and put their fate in the hands of rock fans worldwide who will vote on their favorites. From those votes, four regional finalists will be flown to London, treated like rock stars and given a spot on the bill at Hard Rock Calling 2011; but only one band will open for one of the festival’s iconic headliners on the Main Stage! Past headliners have included Paul McCartney, Stevie Wonder, Pearl Jam, Bruce Springsteen, Neil Young, The Who, Aerosmith, and The Killers. The runners-up will rock out on the Second Stage. The Tampa finalist will receive a future paying gig at the state-of-the-art Hard Rock Cafe Tampa, a stay at the beautiful Seminole Hard Rock Hotel, and $200 cash for each band member. The runner-up will also receive a future paying gig at the Hard Rock Cafe Tampa and get a free Seminole Hard Rock Hotel stay. That&apos;s all for now folks, but stya tuned in for more updates from Jerm on things to do in Tampa Bay and the ever so awesome Tampa Bay nightlife scene!